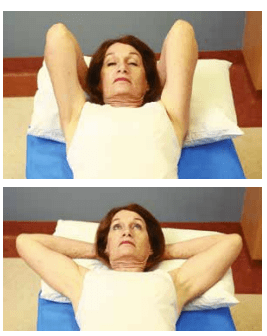 Stiffness of the shoulder may occur after breast or armpit (axillary) surgery. It is therefore important you regain full use of your shoulder as soon as possible after your operation. This can be done with a combination of exercise, massage and by using your arm normally for daily activities at home and at work. 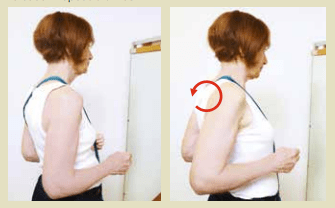 Shoulder movement is improved by doing exercises. It reduces stiffness and also prevents your skin and muscles from becoming tight. The exercises shown in this brochure should be used as a guide. Other exercises may be recommended by your physiotherapist or doctor. Always do the exercises within comfort limits. Stretching or pulling in your armpit with exercise is quite normal.If you are experiencing significant pain whilst doing these exercises, speak to your physiotherapist, breast care nurse or doctor. 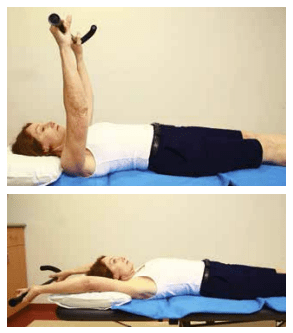 These exercises are for ALL patients including those with a drain in place. They are appropriate for the first 7 days after surgery, or until your first doctor’s appointment. On the first day after your surgery, it is good to get up and sit out of bed and go for a walk. Placing a pillow or a small rolled towel behind your lower back when sitting helps you keep an upright posture. 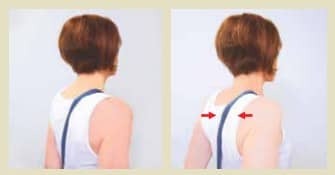 You may place a small pillow on the side of your chest wall for comfort when you are sitting or sleeping but always remove this when you are walking. Remember to keep your back straight and your shoulders back when you sit or stand. Stand tall when you walk. The aim of these exercises is to increase movement, but also to allow time for healing. Do not do the exercises more than recommended or above shoulder height as this may cause pain or oozing from the wound or drain site. Complete each of the exercises below five times. Repeat the exercise program four times a day. Take 5 deep breaths in through your nose and breathe out through your mouth, then breathe in and cough supporting the surgical site with the palm of your hand or a small pillow. v. Bend and straighten your elbow again. Squeeze your shoulder blades together gently and then release. Repeat 5 times. Roll your shoulders backwards. Repeat 5 times. a.) With your arm resting by your side, point your thumb up towards the ceiling. b) Keeping your elbow straight, move your arm up in front of you only to shoulder height (staying within your comfort limits). c) Return your arm to the resting position. Repeat this exercise 5 times. a) With your arm resting by your side, point your thumb up towards the ceiling. b) Keeping your elbow straight, move your arm out to the side to shoulder height (within your comfort limits). If your drain is still in place please do not do these exercises without consulting your doctor or breast care nurse. The following exercises will assist you to gradually increase your shoulder movement. Remember to breathe during all of the exercises. Complete each exercise 5 times and repeat the exercise program 4 times a day. You should continue with these exercises every day for 6 to 12 months. Remember that these photos show the full range of the movement in the exercise. It may take you a number of weeks to be able to achieve your full range of movement. Appropriate progression of these exercises or other specific exercises that may assist you with returning to daily activities or work can be discussed directly with your physiotherapist. a) Stand facing the wall with your arm out straight and your fingertips touching the wall. b) Keeping your fingertips on the wall, gradually walk your hand up the wall until you feel a comfortable stretch. You need to move closer to the wall as your hand reaches higher. b. 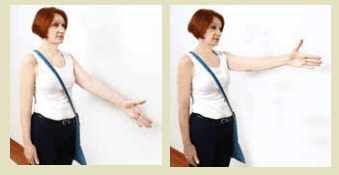 )Keeping your fingertips on the wall, gradually walk your hand up the wall until you feel a comfortable stretch. You need to move closer to the wall as your hand reaches higher. c.)Turn your body away from the wall until you feel an increase in stretch across your chest and armpit. Hold this position for 5 seconds while you continue to take slow breaths, then turn back to face the wall to reduce the stretch. Repeat this movement 5 times. Return your arm to the resting position by your side. a) Stand side-on to the wall with your arm out straight and your fingertips touching the wall. c.)Turn your body away from the wall until you feel an increase in stretch across your chest and in the armpit. Hold this position for 5 seconds while you continue to take slow breaths. Repeat this exercise 5 times. Return your arm to the resting position by your side. a) Lie flat on the bed and place your hands behind your head with elbows straight out in front of you. b) Gently try and bring your elbows out to the side and down towards the pillow. Hold this position for 5 seconds while you continue to take deep breaths. Return your arms to the starting position. Repeat this 5 times. a.) Lie flat on the bed, holding onto a stick (or other straight object such as a long ruler) with your arms down by your side. b. )With your elbows straight slowly lift both arms up to bring the stick over your head as far as you can go within your comfort limits. c.)Return to the resting position. Repeat this exercise 5 times. Massage helps to remove excess fluid and helps improve the mobility of the scar. You can begin to massage the scar when the wound dressing is removed and healing has occurred, usually a minimum of two weeks after your surgery. Check with your physiotherapist, breast care nurse or doctor if you have had any type of breast reconstruction operation, or if you are not sure if the area has sufficiently healed. At first, the area may be painful to touch. The area should become less sensitive and tender as you continue with the massage. You can use cream or oil to make the area easier to massage. Both of these massage techniques can be carried out by yourself or a support person. If you have any concerns about the massage techniques below, consult with your physiotherapist, breast care nurse or doctor. Using the flat of your fingers and with a constant, firm pressure, move your fingers in a circular motion across the scar. Commence the movement at the outer edge of the scar, moving towards the middle of your body. The scar may be sensitive at first, but will become less tender. You can adjust the pressure of your massage as it becomes less sensitive. Concentrate on any tight bands or hard nodules of the scar tissue. Repeat this movement for 2 minutes, twice a day. Using the flat of your hand and with a constant, firm pressure, massage from the elbow to the armpit and across the chest. Repeat this movement for up to 5 minutes, once a day. Do not massage towards the hand and fingers. This can be started 7 days after surgery or after any dressing or drains in the axilla have been removed. If you have any concerns or are unsure about anything in this brochure, speak to your physiotherapist, breast care nurse or doctor.